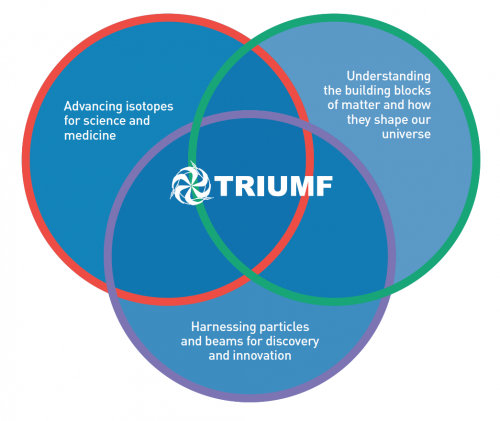 TRIUMF is a publicly-funded national laboratory with a basic-research mission. Owned and operated as joint venture by a consortium of Canada universities, we provide a pool of talent, skills, and capabilities that no single university could maintain on its own. Our laboratory's activities are framed within Vision and Mission, underpinned by a strategic plan developed every five years and subject to review, approval, and funding by the Government of Canada and other agencies. TRIUMF’s many important achievements were enabled by public funding from the provincial and federal governments and through the judicious use of all available resources: financial, intellectual, and physical. Similarly, TRIUMF’s plans for the future are enabled by new funding and by continuing to build on the foundation of current resources. The present resources are a culmination of more than $1 billion of public investments over the past five decades coupled with the wisdom and experience of a highly trained, multidisciplinary workforce. Taken together, these resources represent a formidable asset that can be deployed on key areas of the nation’s research and innovation agendas, benefiting Canadians and the world.